Physicists plan a $6.4 million expansion of the $25 million Telescope Array observatory in Utah so they can zero in on a “hotspot” that seems to be a source of the most powerful particles in the universe: ultrahigh-energy cosmic rays. 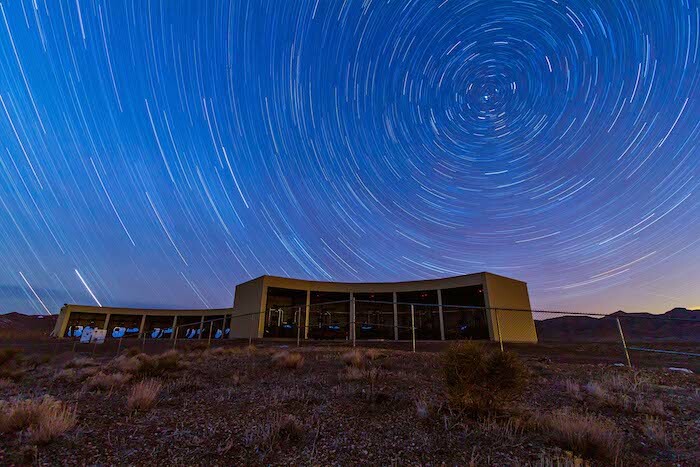 Japan will contribute $4.6 million and University of Utah scientists will seek another $1.8 million to nearly quadruple the size of the existing 300-square-mile cosmic ray observatory in the desert west of Delta, Utah. “The question has been staring us in the face for 40 years,” says Pierre Sokolsky, a University of Utah distinguished professor of physics and astronomy and principal investigator on the Telescope Array’s current National Science Foundation grant. The planned expansion would make the Telescope Array almost as large and sensitive as the rival Pierre Auger cosmic ray observatory in Argentina. Together, they cover both the northern and southern skies. Cosmic rays, discovered in 1912, aren’t really rays, but are subatomic particles, including bare protons and nuclei of atoms such as helium, oxygen, nitrogen, carbon and iron, many of which carry relatively low energies and come from within our galaxy from exploding stars, other stars and the sun. But the source of ultrahigh-energy cosmic rays – which are mostly bare protons – is a mystery. – Japan, which paid for about two-thirds of the existing $25 million observatory, will spend another 450 million yen (currently $3.6 million) to expand the existing array of table-like scintillation detectors that measure “air shower” particles produced when incoming cosmic rays hit nitrogen and other gases in the atmosphere. The array now has 507 detectors spaced in a grid over 300 square miles of desert west of Delta. The expansion will see two lobes containing 400 more detectors added to the array’s footprint, so it will expand to almost 1,000 square miles. One lobe will extend north-northeast from the existing array; the other south-southeast. – In addition, Japan will kick in another 125 million yen ($1 million) for an “infill” array of another 60, much more closely spaced, scintillation detectors to better measure air showers generated by lower-energy cosmic rays. While the observatory is focused largely on the mystery of ultrahigh-energy cosmic rays from far beyond our Milky Way galaxy, physicists also want to collect more information on lower-energy cosmic rays produced by exploding stars in our own galaxy. – The University of Utah will apply this fall for a $1.8 million grant from the NSF to add two fluorescence detectors to the three existing ones at the Telescope Array. Each fluorescence detector is a building containing many mirrors that detect faint blue flashes in the sky created when incoming cosmic rays hit gases. That can be done by nearly quadrupling the ground area covered by the scintillation detectors and adding two more fluorescence detectors, he adds. The proposed expansion plan was discussed June 8-10 when the Telescope Array collaboration met at the University of Utah for its twice-a-year meeting. Sokolsky says the visitors included about 20 researchers from Japan and several more from Russia and Belgium. South Korea also is part of the collaboration.